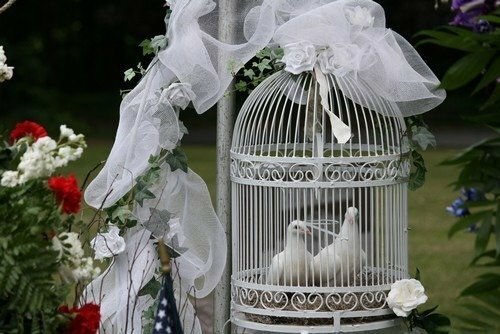 Thinking of releasing white doves to commemorate your wedding or the memorial of a loved one? Think twice, and do some research. 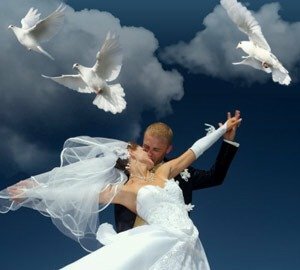 White doves: symbols of love, commitment, peace, hope, etc. However: they are not wild birds, and have no idea how to survive outside captivity. Where do they go after they fly away? This is an important question. 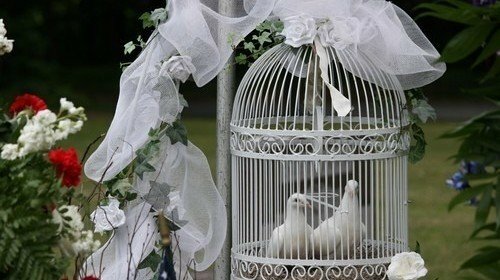 If you are determined to release white doves at your ceremony, it is essential to make sure you can afford to hire people who will release strong, healthy birds who at least have a chance of returning home to their roost. The only type of “white doves” capable of surviving an event release are white racing pigeons, technically known as “Rock Doves” (Columba livia). They are highly trained homing pigeons, which is why it costs more to hire a company that will deliver this type of bird, and to make sure they are released correctly. 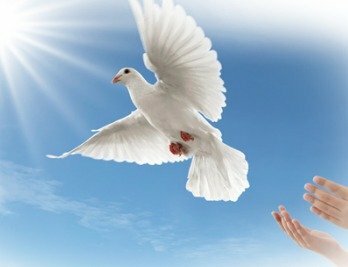 Reputable companies belong to the International White Dove Society or the National White Dove Release Society, organizations which set rules of conduct and ethics. Ethics include things like not releasing doves in bad weather, near dusk, in dangerous areas, or keeping them for hours in a small cage while waiting for the perfect moment … things that would seem obvious to anyone who sees animals as sentient beings, but not necessarily to someone who views a basket filled with doves the same way they view a basket filled with rose petals. Ethical businesses post notices on their websites stating that unless the released birds are properly trained and conditioned, they will not survive. Ethical businesses put small identification bands around their birds’ legs, so they can get them back if they become lost. People who want to release birds on the cheap buy doves – usually Ring-necked Doves – from pet stores, and release them themselves. Ring-necked doves don’t fly well and have no survival skills. Once released, they will fly a short distance, land, then wait for someone to come feed them. After a few days they will die of starvation, unless a predator gets them first. Sometimes this happens to racing pigeons, as well. Wildlife rehabilitators constantly receive lost racing pigeons who are starving, riddled with lice, and suffering from coccidia, trichinosis, or worms. If the birds are not banded, there’s no way to tell if they were released at a ceremony or if they’re racing contest pigeons who went off course (the racers who fly in homing contests are another whole subject). “Didn’t the Pope have an issue with this sort of thing recently?” asked Gay Frazee, on the Eastern Shore of Virginia, referring to the time Pope Francis released two white doves as a symbol of peace, and they were immediately attacked by a gull and a crow. It’s true: many people are so removed from the natural world that they don’t understand the consequences of their actions. I doubt anyone would want to begin their wedded life or celebrate the memory of a loved one by killing one or more gentle, lovely birds, however unintentionally. You need to release bubbles or throw flower petals instead. The birds will probably not survive release. It is a more beautiful memorial for a family when no living creatures get hurt. Where am I Birding the Second Week of May? There Are Migratory Birds Other Than Wood-Warblers. Who Knew?